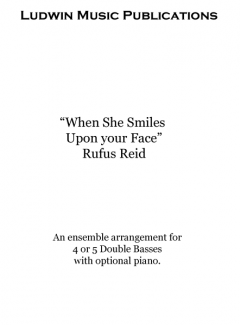 This bass ensemble arrangement, “When She Smiles Upon Your Face,” is written for four or five Double Basses with an optional piano part. It includes the score and all the parts. The melody was originally composed for the 80th birthday of a dear family member who is also an exceptional pianist. This particular arrangement was written specifically for the June, 1999, International Society of Bassists Convention. It was. performed by John Clayton, Michael Moore, Martin Wind and Rufus Reid. They were joined by master pianist/composer, Bill Mays. This composition was sung as a ballad by Grady Tate with TanaReid on their CD “Back To Front” Evidence Music ECD 22206-2. This CD is also available on my Music page.